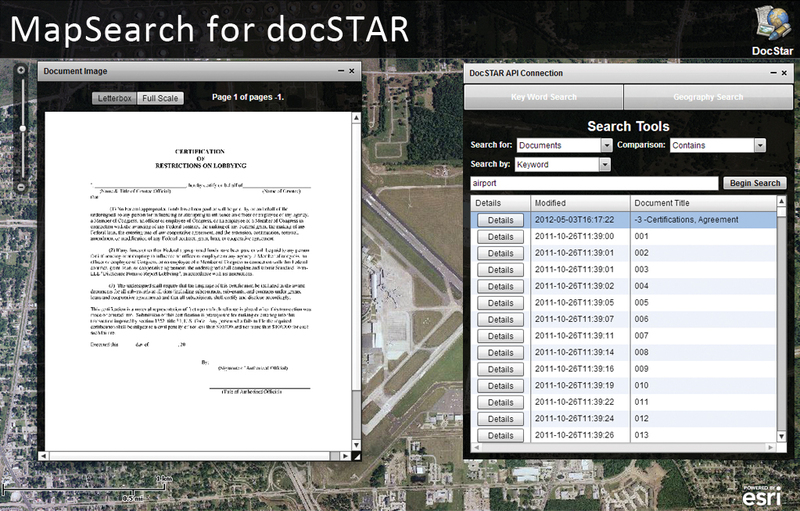 MapSearch for docSTAR associates documents to geographic locations. It can search by keyword or by clicking on the map. 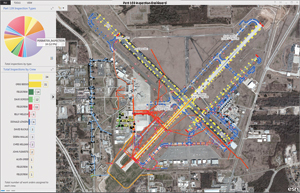 The enterprise GIS developed by a Louisiana airport helps not only to meet federal reporting requirements but also to save money and better connect the airport with its customers. Recently, the Federal Aviation Administration (FAA) began implementing NextGen data requirements for airports. NextGen is an umbrella term for the ongoing transformation of the National Airspace System (NAS) in the United States from a ground-based system of air traffic control to a satellite-based system of air traffic management. The NextGen initiative mandates that airports collect survey-grade datasets, called Airport GIS (A-GIS), so the FAA can manage the spatial data needed to support safe aviation. Although many small- to medium-sized airports without major IT resources are fulfilling the requirements of the FAA, many do not fully benefit from the A-GIS data they collect. To address that concern, Baton Rouge Metropolitan Airport (BTR), located in the southeast portion of Louisana along the Mississippi, partnered with GEO-Jobe GIS Consulting to extend the reach of its A-GIS data. With some grant money received through ongoing airport projects that can benefit from GIS, the airport was able to implement an enterprise GIS solution that includes Esri's Aeronautical Solution and ArcGIS Online. Like municipalities, airports comprise different departments and interact with various entities. Airports host multiple airlines, fixed-base operators (commercial businesses that provide aeronautical services), and retail tenants. Airports must maintain the highest level of coordination to ensure consistent revenue generation and comply with FAA standards and constantly changing land-use rules. In addition, to stay competitive, airports must execute expensive, multi-year airport improvement projects: runway extensions, obstruction analysis, pavement projects, and terminal improvements. The Part 139 Inspection Dashboard provides in-office users with focused inspection information for monitoring activities throughout the day. "To confront the rising costs, airport managers sometimes turn to IT consultants to implement 'improved' technology," said Eric Edmonds, vice president of marketing at GEO-Jobe. "However, once installed, many of their investments never actually get used by airport staff. Over time, the glamour and promise of technology wears off and staff just gets cynical." BTR wanted to avoid that situation. In 2010, the airport partnered with GEO-Jobe to perform a health check of its operations. Over the course of a week, GEO-Jobe met with airport personnel and found opportunities for GIS to play a critical role in the decision making and daily operations of the airport. Enterprise health checks are rarely welcomed by a work force. Like a patient visiting a new doctor, departments can be suspicious of an outsider evaluating the inner workings of a familiar system. "Our initial presentation on basic Airport GIS wasn't well received by several administrators," said Edmonds. However, when GEO-Jobe staff met with department heads individually, managers relaxed and talked openly. Casual conversations with BTR staff revealed operational pain points. These interactions built trust and identified opportunities to make processes more efficient. The solution born from GEO-Jobe's assessment was an enterprise GIS that allowed the airport to push its A-GIS to the FAA. "We started by mining data and installing all the necessary hardware and software to host and serve it," said Edmonds. Collecting existing GIS datasets from local government agencies and adding them to the airport's geodatabase was a crucial first step. 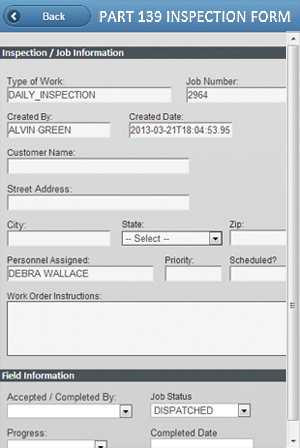 Part 139 Inspection Mobile provides a single point for inspection, creation, dispatch, and completion in the field. To make all facility information accessible through the platform, Edmonds' team converted BTR's Airport Layout Plan and information, which included CAD drawings and blueprints of construction projects, into a format that could be added to a geodatabase. 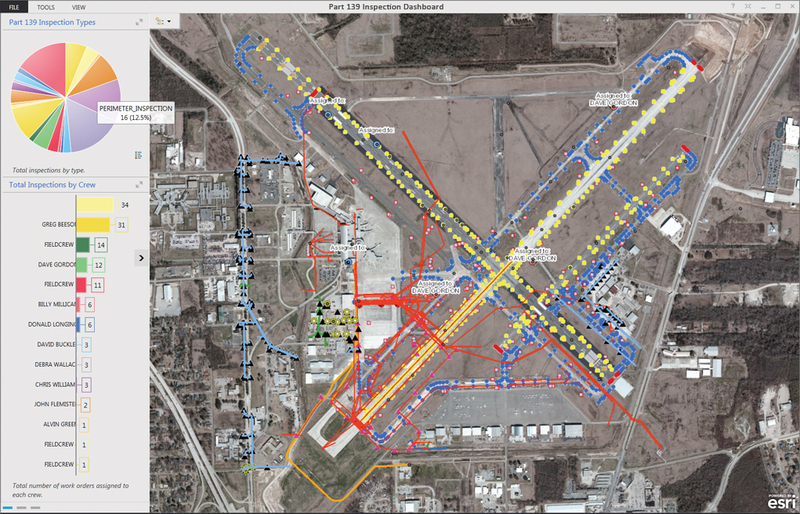 ArcGIS for Server, ArcGIS Online, and Esri Aeronautical Solution were used to give the airport a central platform for creating and sharing GIS data across departments and with the FAA. In the first show-and-tell meeting with the airport after the initial implementation, one of the staff members asked GEO-Jobe to calculate the area of a recently acquired parcel adjacent to the airport. The airport had just spent several days surveying the property even though it only needed sub-meter approximations. To show how even the simplest GIS tools can empower them, one of GEO-Jobe's staff members traced the same parcel using the measuring tool in ArcGIS Online. "It took less than 10 seconds to trace and calculate the area," said Edmonds. "The difference between calculations was only a few feet." GEO-Jobe's evaluation of one of the airport's most critical procedures—Part 139 Inspections—came early in the needs assessment. [The FAA, under Part 139 of Title 14, Code of Federal Regulations, issues Airport Operating Certificates and conducts periodic inspections to ensure airports are meeting the requirements of Part 139.] Inspections were a major headache for the Operations Department. After carefully canvassing the runway and taking handwritten notes, inspectors would input their notes into a system in the office that generated new work orders. The status of these work orders was tracked on a white board. GEO-Jobe eliminated that cumbersome process by creating a Part 139 Inspection app that enables field crews to create, dispatch, and complete work orders and inspection reports on the fly. With the app, the operations manager can also track the status of inspections and work orders and locate his field crew at all times. 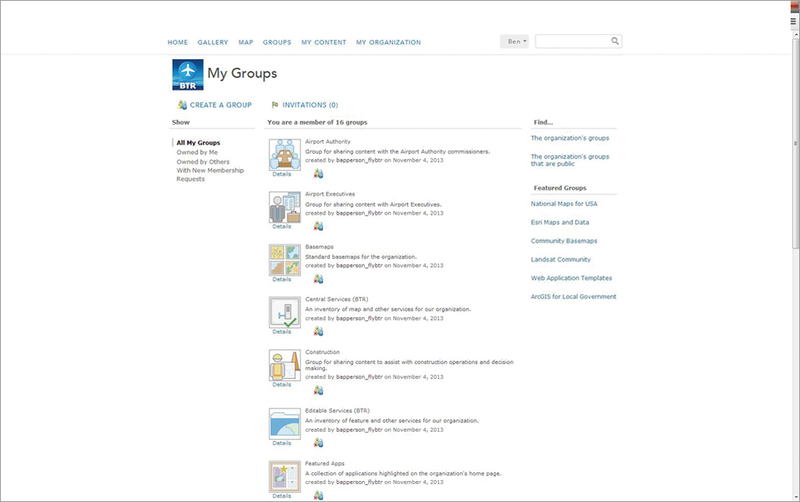 BTR is strategically organized within ArcGIS Online through 16 defined groups. To reduce the generation of paperwork and archiving of paper documents, GEO-Jobe refined the airport's document management process by creating a location-based document management system. The system enabled instant classification of all paperwork, which was fully accessible via a web application to staff who had the necessary security clearances. 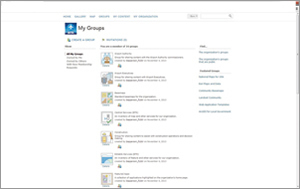 The system resembles a typical digital library catalog. 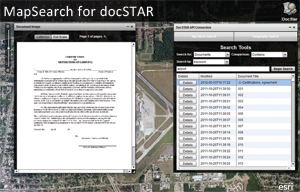 All digitized documents are linked to features and areas on the airport's main map viewer. By clicking on specific property, airport staff can quickly pull up documents such as lease agreements, construction bids, architectural drawings, proposals, building footprints, bid acceptance, and repair orders. Correspondence between the airport, its consultants, and the local government is also tracked in the application. The later stages of the airport's GIS overhaul will involve creating additional apps for both the airport and the public. Several apps that are currently being registered with the airport's ArcGIS Online account include an airport information map, marketing map, construction status map, and noise mitigation status map. Through its partnership with GEO-Jobe, BTR has become a model for small- to medium-sized airports. "The project has proven that, with the right platform, airports can comply with FAA standards and also use the data to build a full-scale GIS that can be used across airport departments and better serve travelers and the local community," said Edmonds.